A 45-mile paved National Recreation Trail along the route of an abandoned railroad is one of the most popular parts of the Northern Virginia Regional Park Authority system. The Washington & Old Dominion Railroad once ran from Alexandria to Purcellville; this trail follows the old roadbed with a paved trail for walking, running, and bicycling. A parallel trail can be used for horseback riding on the section of the trail from Vienna to Purcellville. 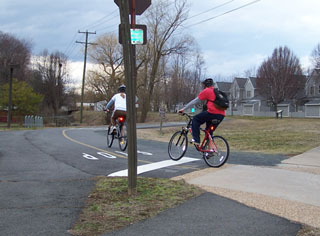 In the city of Fairfax, a system of bike routes connects to the W&OD trail. Gateway Regional Park is being built as a trailhead and rest stop in the city of Fairfax. The W&OD travels through Leesburg, where bikers can connect to the C&O Canal and points in Maryland near White's Ferry. The W&OD Trail is part of the "Find Your Chesapeake" project of the National Park Service and the Chesapeake Conservancy. For details, select this link.